RYSCO Shipyard, Inc. recently delivered the tug/supply vessel Tom Martin Pugh to Billy Pugh Offshore. This is the fifth vessel built for Billy Pugh by RYSCO's Blountstown, Fla., yard. The latest vessel has an overall length of 175 feet, beam of 38 feet, and depth of 14 feet, and is capable of carrying 3,000 cubic feet of dry mud in four tanks. Fuel capacity is 37,600 gallons, fresh water 55,740 gallons, and drill water 134,298 gallons. Her cargo deck measures 15 feet 6 inches by 13 feet 8 inches, and is capable of a deck load of 495 long tons. Main propulsion is by twin Caterpillar D-399TA diesels, each rated 1,125 bhp at 1,225 rpm, equipped with Caterpillar 7261 reverse/reduction gears, Aquamet shafting, and Johnson Cutless bearings. The two propellers are Coolidge 4-blade, stainless steel. A Schottel S152L bow thruster is powered by a Detroit Diesel 8V71 engine. Two 99-kw ship's service generators are driven by Detroit Diesel 8V71s. Steering is by Skipper Hydraulics, engine alarm system by E.M.I., and dry mud system by SMATCO. Electronics include two Decca 65121 HA radars, Drake TRM-1 SSB radio, Raytheon R-2460-W depth recorder, Raytheon 350 Loudhailer, and Triton 55/75 VHF radio. 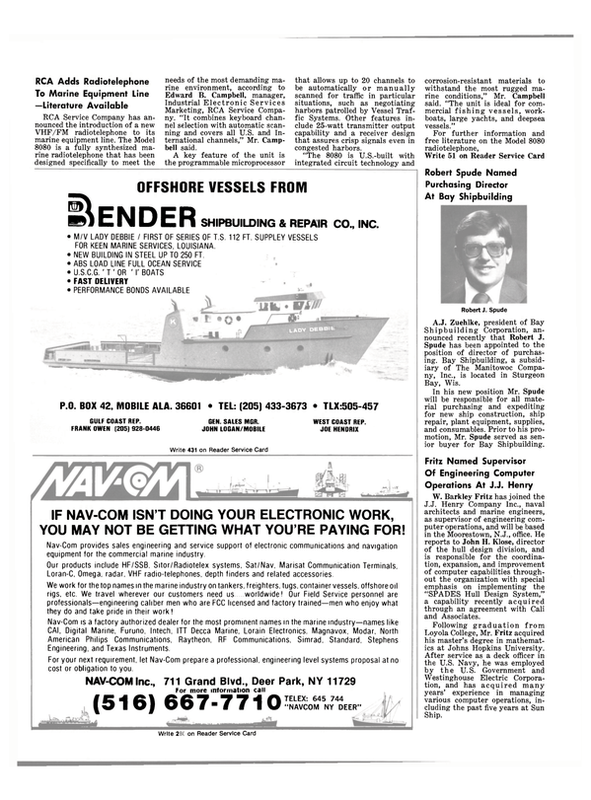 The Tom Martin Pugh is classed +A1 by the American Bureau of Shipping, and is certified under U.S. Coast Guard Subchapter I.